Even men with debt problems fall in love, and when they do, many of them will come up with a way to give their beloved a nice engagement ring. Often, heaven and earth will be moved in the search for the proper ring,and the result could be a veryexpensive engagement ring. If the gentleman happens to file chapter 7 bankruptcy before the wedding, this could spell trouble. But how could this be? If the engagement ring was given to the fiancee prior to the man’s bankruptcy filing, it was no longer his property, right? And if it were no longer his property, how could he lose it in bankruptcy? The answer to how the engagement ring could be lost to the bankruptcy trustee is found in section 548 of the bankruptcy code. Section 548 provides that if a bankruptcy debtor gives away money or property in the two years prior to filing bankruptcy, and if the bankruptcy debtor receives no actual value in return for the item given away, then the bankruptcy trustee can recover the money or property from the recepient. It is common for a chapter 7 trustee to assert that the gift of an engagement ring to a fiancee in the two years prior to filing bankruptcy fits into section 548 very nicely. The trustee then demands that the fiancee return the engagement ring to the trustee to be sold to pay creditors. However, this unhappy result can be avoided by paying careful attention to how the gift of the engagement ring is characterized in the bankruptcy papers. Under the common law ofmost states, when a man gives the fiancee an engagement ring, he hasn’t really “given” her ownership of the ring, unless the twohave expressly agreed otherwise. 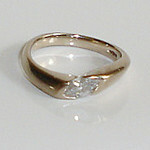 Instead, the engagement ring remains the man’s property until the marriage ceremony has taken place. If the engagement is called off, the fiancee is required to return the ring to the man. Legal ownership of the engagement ring does not shift to the fiancee until the marriage ceremony is completed. Accordingly, a man filing bankruptcy in this situation should be careful to declare the engagement ring as his property in the bankruptcy papers, and subject to being claimed as exempt from the trustee as the man’s property. This will prevent the trustee from claiming that the engagement ring was given away prior to bankruptcy within the meaning of section 548. This same strategy can be used in reverse against the trustee if the fiancee files bankruptcy prior to the marriage ceremony. The fiancee should note in her bankruptcy papers that she is in the possession of an engagement ring, but that the actual ownership of the ring remains in her betrothed. Because the fiancee is only a custodian of the engagement ring, rather than the fiance being the owner, she cannot lose the ring to the trustee. Even in the rare case where the engagement ringhas actually become the fiancee’s property prior to the marriage ceremony, all may not be lost. This is because section 548 provides that the trustee’s recovery of the ring is to be reduced dollar for dollar by any new value provided by the fiancee to the man subsequent to the gift of the ring but before the bankruptcy filing. This means that a careful accounting of any money or property given by the fiancee to the man after the gift, but before the man’s bankruptcy, could establish that the trustee is unable to recover the full value of the ring from the fiancee. Returning the ring to the man may also accomplish the same result, if the parties are sincere about the nature of this transaction and it is properlydescribed in the bankruptcy papers.